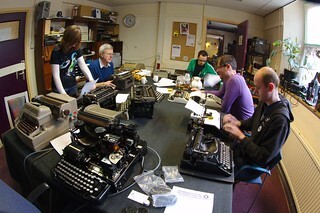 Spider, one of the Hack42 members, organized the first ever official Type-In in The Netherlands, an arranged meeting of manual typewriting enthusiasts. Also part of the Type-In, was a screening of the documentary "The Typewriter (In the 21st Century)" (IMDB). The next official Dutch Type-In will be at OHM2013, also combined with a screening of the Typewriter movie. For a list of officially announced Type-In's worldwide, visit The Type-In Page.